Warm and spicy, meaty and comforting. 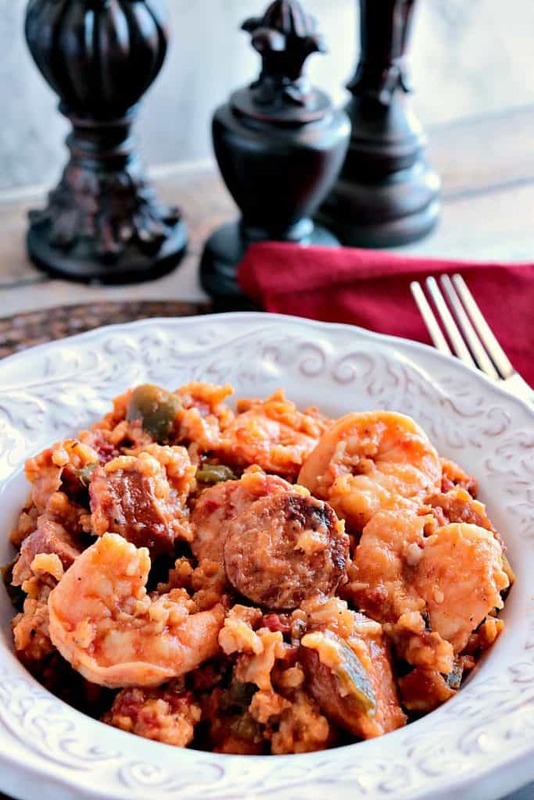 My Kudos Kitchen style Sausage & Shrimp Jambalaya will make you want to kick up your heels and party all Mardi Gras season, and beyond! 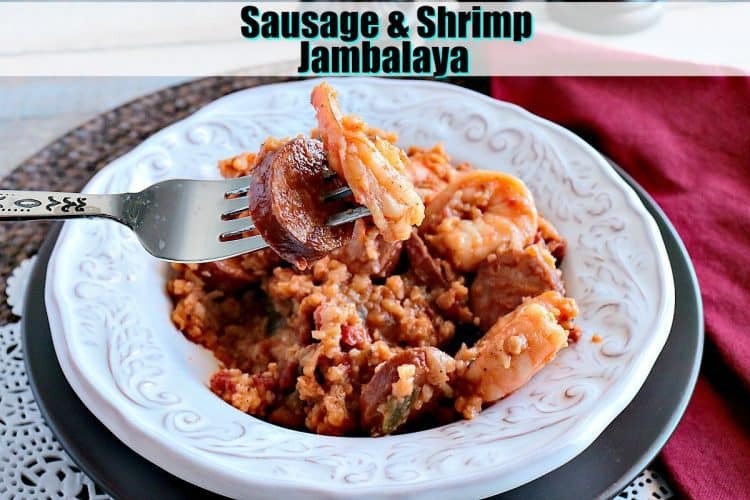 While I don’t claim to cook a lot of Cajun recipes, what I can claim is that my Sausage & Shrimp Jambalaya Kudos Kitchen Style is a complete winner! 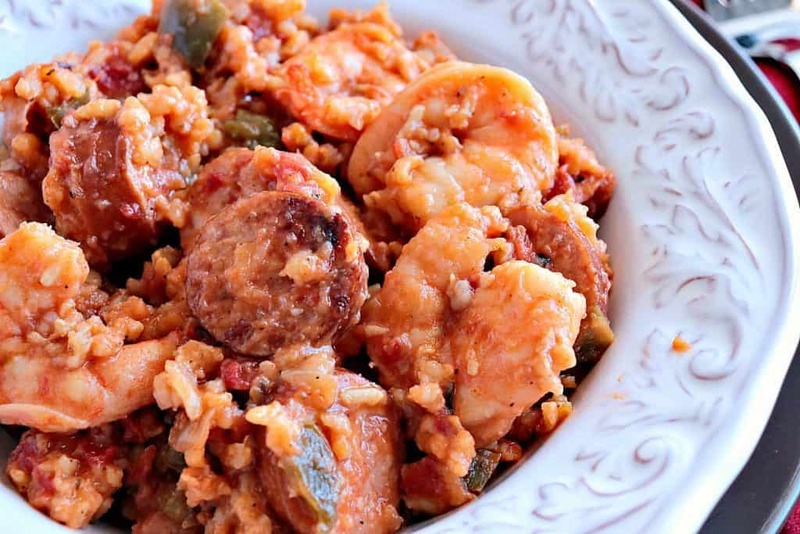 To make Sausage & Shrimp Jambalaya Kudos Kitchen Style you’ll need; smoked sausage, uncooked shrimp (tails off and deveined), green bell pepper, yellow onion, celery (I didn’t use any because I forgot it at the grocery store), garlic, olive oil, canned diced tomatoes, chicken broth or stock, Cajun seasoning, Old Bay seafood seasoning, brown rice (long grain or instant), salt and pepper. Have you ever been to Mardi Gras? I never have, but it’s on my bucket list for sure. Until that time, I’ll have to make do with my own Kudos Kitchen interpretation of this New Orleans classic. Chop one medium green bell pepper and one medium yellow onion, (1 cup chopped celery can also be added, but sadly I didn’t have any). Add the chopped veggies to a heavy stock pot with 2 tablespoons olive oil. Saute over medium/high heat stirring frequently for 1 – 2 minutes. Meanwhile, slice the smoked sausage into ½” rounds. Add the sliced sausage to the pan with the vegetables and cook, stirring occasionally until the sausage starts to brown (approximately 5 minutes). Add 2 cans of diced tomatoes to the pot along with minced garlic, chicken broth or stock, Cajun seasoning, Old Bay seasoning, salt, and pepper. Bring the mixture to a simmer and reduce the heat to medium. Add the brown rice, cover and simmer until the rice is tender and almost all of the liquid is absorbed. *Note – if using long grain brown rice, this will take 40-45 minutes. If using instant brown rice, this will take 5-7 minutes. When the rice is tender, stir in the peeled and deveined uncooked shrimp and stir well. Place the cover back on the pot and cook on low until the shrimp is pink and opaque (approximately 5-7 minutes). 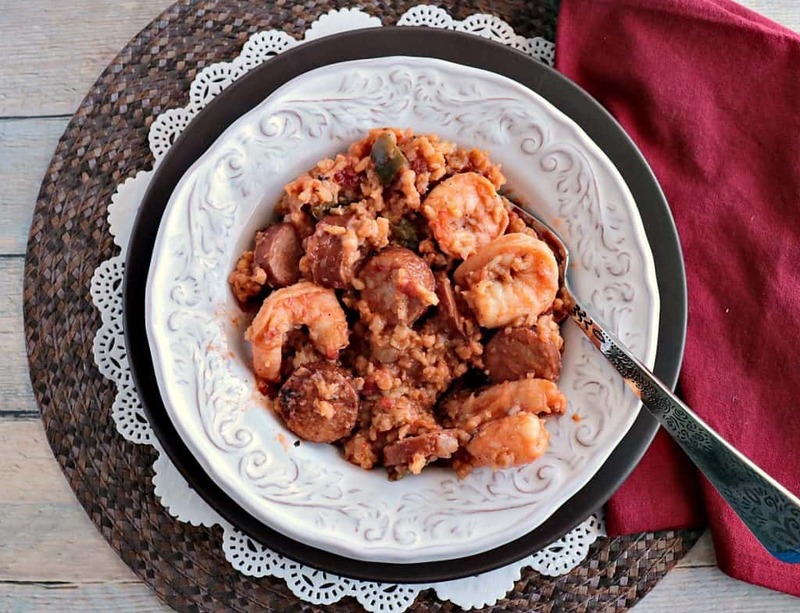 Spoon the Sausage & Shrimp Jambalaya into a bowl and serve hot! This dish has a tiny bit of heat in it which carries through to the very last bite. It’s not a smack-you-over-the-head heat. It’s a subtle and understated heat, but one that will definitely get noticed…and appreciated. In a large Dutch oven or stockpot, heat the oil over medium-high heat. Add the bell pepper, onion, and celery to the pot. Cook, stirring occasionally for approximately 2 minutes. Add the smoked sausage to the pot to brown, stirring occasionally, for an additional 5 minutes. Stir in the garlic, diced tomatoes, chicken stock, Cajun seasoning, Old Bay seasoning, salt, and pepper to the pot. Bring the contents of the pot to a simmer and add the brown rice. Cover. *Note - if using long grain brown cook covered for 40-45 minutes or until the rice is tender and most of the liquid is absorbed. Add the shrimp to the pot (return the heat to medium). Stir and cook covered an additional 5-7 minutes or until the shrimp are pink and opaque. 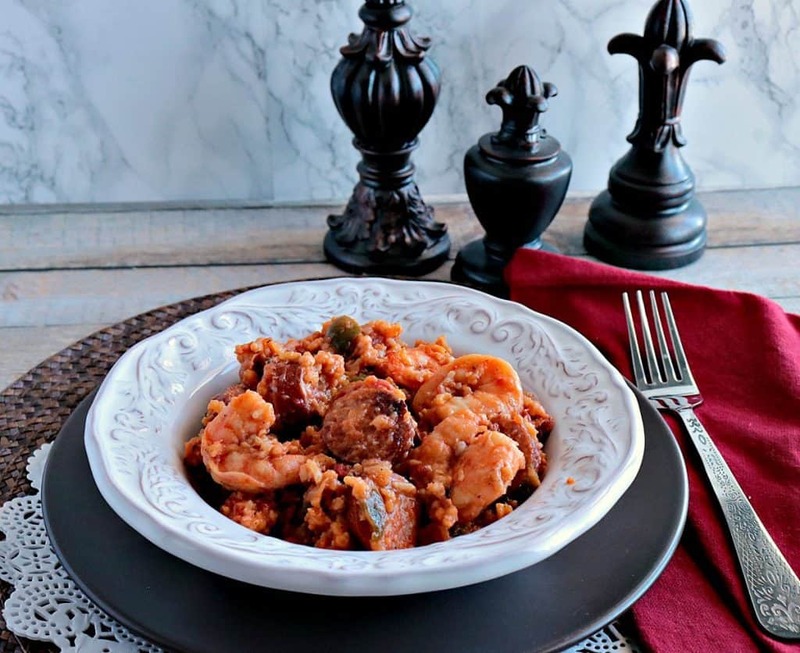 I hope you’ve enjoyed this recipe for Sausage & Shrimp Jambalaya Kudos Kitchen Style as much as I’ve enjoyed bringing it to you. Should you have any questions regarding this, or anything else you see on my site, please don’t hesitate to contact me directly, or leave me a comment in the comment section below. It is always my distinct pleasure to get back to you with a reply just as soon as I possibly can! Looks like a hearty and flavorful meal! It really is. Perfect for winter nights. One of my favorite dishes of all time! This looks wonderful! I made this last night following your recipe pretty closely (only used one can diced tomatoes and 4 1/4 cups chicken broth) and it was delicious! Makes a lot, too.